Hobbit: Smaug vayronasi (Inglizcha: The Hobbit: The Desolation of Smaug) 2013-yil Warner Bros. Pictures tomonidan ishlangan epik fantastika sarguzasht film. Film gʻoyasi J. R. R. Tolkienning "Hobbit" hikoyasiga asoslangan boʻlib, Hobbit: Kutilmagan sarguzashtlar (2012) filmining davomi hisoblanadi. 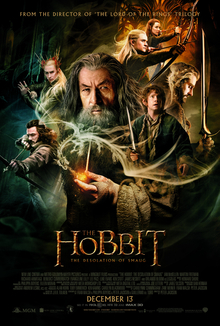 ↑ The Hobbit: The Desolation of Smaug (2013). British Board of Film Classification. 5 April 2014. ↑ 2,0 2,1 The Hobbit The Desolation of Smaug (2013). British Film Institute. 25 July 2014. ↑ FilmL.A. (March 1, 2014). "2013 Feature Film Study". https://www.filmla.com/wp-content/uploads/2016/06/2013-Feature-Production-Report-w-Release-030614_1394125127.pdf. Qaraldi: July 5, 2017. ↑ The Hobbit: The Desolation of Smaug. Box Office Mojo. Amazon.com. 27 April 2014. Bu sahifa oxirgi marta 19-Noyabr 2018, 01:59 da tahrir qilingan.